Home » Blog » Biosimilars & Originators – What’s the Link? Biosimilars & Originators – What’s the Link? The Centers for Medicare & Medicaid Services (CMS) issued a new guidance on biosimilar reimbursement on March 30, 2015 was needed based on FDA approval of the biosimilar Zarxio™ (filgrastim-sndz). The guidance describes the Medicare Part B reimbursement for biosimilars. Reimbursement for drugs provided through Medicare Part B uses Average Sales Price (ASP) as the cost basis plus a markup. Since biosimilars are expected to have lower prices than the originator, Medicare is expecting to save money with biosimilars. The challenge seen by providers is that with a lower ASP for the biosimilar, the markup provides the same percentage but a lower dollar value margin than the originator. The incentive for the provider is to use the originator product with the higher dollar markup. The CMS guidance changes this incentive by making the biosimilar reimbursement use the biosimilar ASP but the originator ASP markup. This keeps the markup the same and incentivizes the use of the lower cost product. It may sound easy, but how do you add the markup factor from one drug to another? With only a few biosimilars, this could certainly be handled manually. As more and more biosimilars launch, this will be a daunting task. All the more reason for the drug compendia to group the biosimilar with the originator. The drug compendia will most likely try to fit the biosimilars into their current groupings. Even if the compendia don’t link biosimilars to the originator product using the current methods, they may be influenced to add a new biosimilar specific linking mechanism. Thinking ahead, when will CMS release the next guidance to account for the scenario that the originator has exited the market and only the biosimilar(s) are left? Without the ASP from the originator, the provider markup could change to the biosimilar ASP. This scenario may not be required for years. PHSI experts understand the drug compendia and the impacts on pharmaceutical manufacturers, PBMs, and pharmacies. The expectations for biosimilars are uncertain but will become clearer with additional guidances expected in 2015. Please contact us to discuss the biosimilar impacts and challenges you are experiencing or expecting. 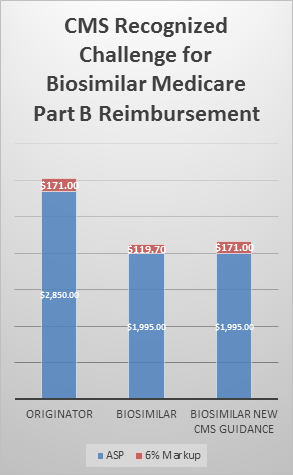 PHSI provided an update on Biosimilar Reimbursement.